I’m calling 2018 the Year of the Nostalgic Christmas. Everywhere I turn, I’m swept up in memories of my childhood Christmases. 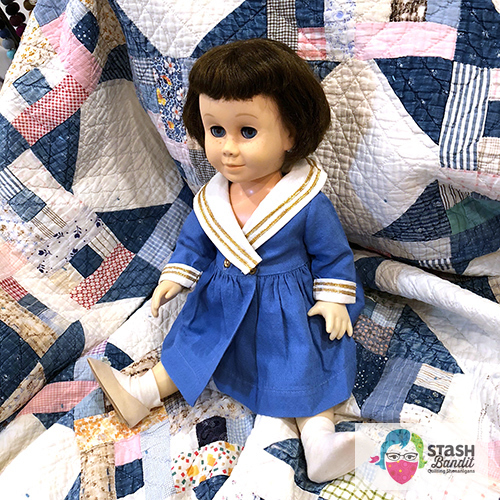 They’ve pressed down on me so frequently and with such ferocity that I’ve been finding the items in thrift stores, antique shops and online auctions. Most of the time, I wasn’t even looking for them. When I around four or five, all I wanted in life was a Chatty Cathy. 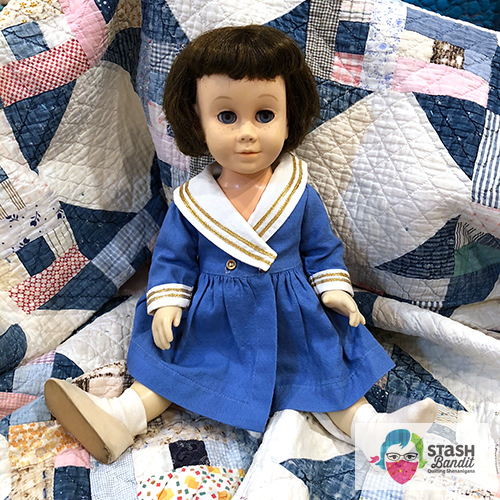 You may remember from the early 1960s that she was a talking doll with a sweet face, and you could get extra outfits for her. If I could have only one Christmas present that year, then fine, as long as it was a Chatty Cathy. Nothing else mattered. 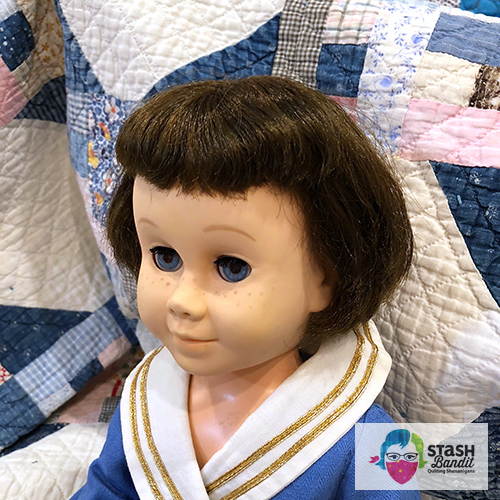 So imagine my surprise when I walked into my parents’ room one day in December to find the bed covered with all kinds of toys and gifts, including my very own Chatty Cathy. I saw her with my own eyes! I shrieked with delight and ran to tell my older brother, who must have been in charge of me that day, in my mother’s absence. I don’t remember much after that, except that he tried to get me to eat a tomato. I still don’t like tomatoes. He must have told my mother that I’d seen the presents because some time later, she told me that those gifts were not for us. I was pretty sure she was fibbing, because I was the only girl, and who else could Chatty Cathy possibly be for? Fast forward to Christmas Eve. I opened all my gifts. There was no Chatty Cathy. I was a little kid so I’m sure there were other nice things which probably distracted me from the disappointment momentarily. Here’s what I think happened: My mother was a determined woman, and I doubt she could bear the thought of being foiled by a pre-schooler. I think she wanted me to be surprised on Christmas, so she returned the doll to the store and bought another. She must have had no idea how desperately I wanted the Chatty Cathy. Funny thing is, my mother died when I was 36, and I never asked her about this. 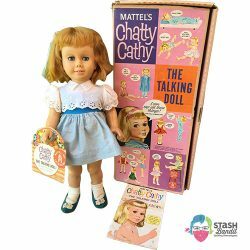 It didn’t really start to bother me until I approached middle age (I’m 58), but for the past few years, I have started lusting after Chatty Cathy once more. She’s been on my mind a lot. And guess what?! Not long ago, I found the Chatty Cathy of my dreams on eBay. Opening the box that day not long ago felt like coming home. 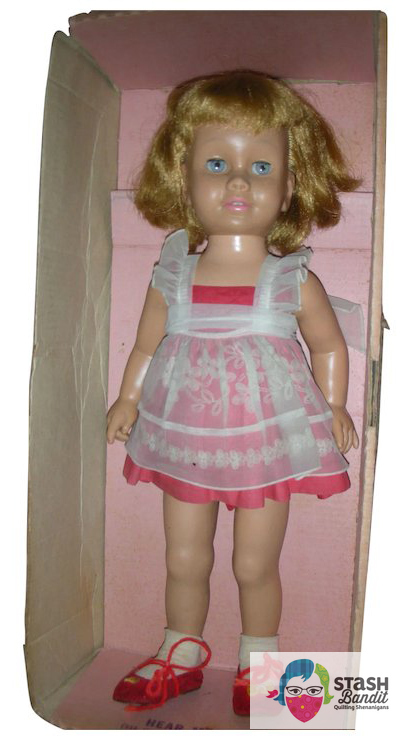 I finally had my dream doll. I’m in love with her hair (brunette, like mine!) and her blue eyes. 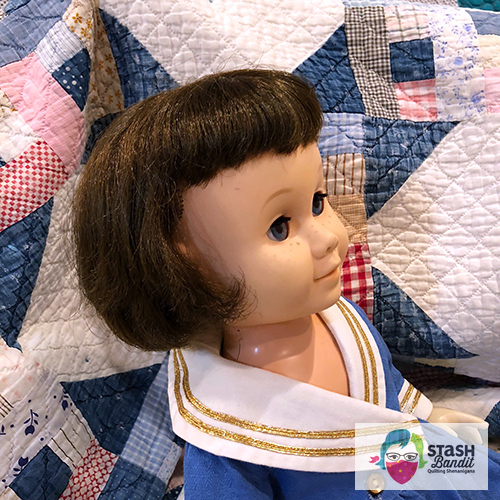 Her little blue sailor dress is charming! She has only one shoe, which may be why she was priced at just $15. I’m enamored with this girl! She has a few freckles. She’s perfect in every way. She doesn’t talk anymore, but I prefer silence anyway. I have rarely been so satisfied. I think my mom is probably smiling from heaven. And that was just the start of my nostalgia this Christmas. Of all my childhood toys, I treasure having my Chatty Baby the most. Skipper and my Mary Poppins LP come in a strong 2nd and 3rd. Haha! So happy that you found a Chatty Cathy of your own. It’s a treasure!